NOTE: All of the materials included in this offering have been updated and are included in the IT Governance Infrastructure. This product is obsolete and no longer sold. The client/server model has become one of the central concepts used in network computing. Most applications written today use the client/server model as does the Internet's main program, TCP/IP and the DNS addressing model. In marketing, the term Client Server has been used to distinguish distributed computing by smaller dispersed computers from the “monolithic” centralized computing of mainframe computers. But this distinction has largely disappeared as mainframes and their applications have also turned to the client/server model and become part of network computing. The Client Server Management HandiGuide contains over 160 pages of practical ways to manage the Client Server operating environment. 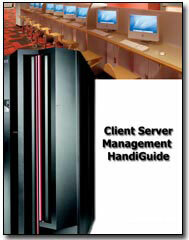 The Client Server Management HandiGuide is available in both PDF and MS WORD formats. Asset Security and Control - which provides detailed policy on security and access control. You can also get the Handiguide bundled with the most popular and proven procedures which are based on industry defined best practices and meet all mandated requirement. In addition an annual update service is also available. You have the flexibility to edit the electronic HandiGuide via MS WORD. 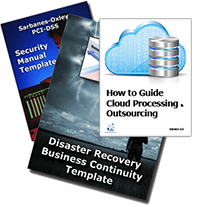 It can be quickly modified to meet your enterprises specific needs. Plus as an added bonus the Client Server Management HandiGuide™ can be acquired with the CIO IT Infrastructure Policy Bundle. The Client Server Management HandiGuide, provides a comprehensive set of policies for the important areas of client/server management. The book offers an excellent foundation from which managers can build their policies as they gain expertise. As Janco warns, not having such a foundation could be a real liability for a manager.